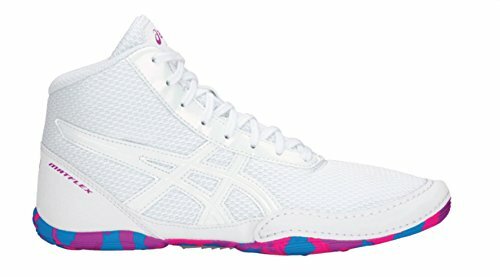 The ASICS® Kids Matflex 5 GS is a wrestling shoe that will hold its own in the ring! Breathable mesh upper with synthetic overlays. Integrated lace-closure complies with wrestling rules. Sightly padded tongue and collar for a good feel against foot. Mesh lining for a breathable wear in shoe. Full length gum rubber outsole offers superior traction. Imported. Measurements: Weight: 5 oz Weight of footwear is based on a single item, not a pair. Integrated lace-closure complies with wrestling rules. Sightly padded tongue and collar for a good feel against foot. Mesh lining for a breathable wear in shoe. Full length gum rubber outsole offers superior traction. Imported. Measurements: Weight: 5 oz Weight of footwear is based on a single item, not a pair.